We are growing and with that the need for volunteers arises. TiAnViCa facilitates Equine Assisted Activities for two different programs which meet on different days and hours. Our Wounded Veterans Program meets on Thursdays from 9AM until noon. This program is geared towards Veterans from all over Polk and surrounding municipalities. As a volunteer you will assist those who need assistance in grooming and tacking their horse, leading the horse in lessons and assisting the rider as a sidewalker during lessons. Other barn chores (mucking stalls, untacking horses) apply. Our TR program is geared towards the special needs community in Polk County and surrounding areas. This program meets on Friday afternoons from 2:30PM until 5:45PM and Saturday from 8:30AM until 12:45PM. As a volunteer in this program you will groom and tack the horses fro the riders. 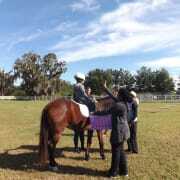 During lesson time you will lead the horse and/or assist the riders during lessons. Other barn chores (mucking stalls, untacking horses) apply. Lessons in all programs are under the supervision of a PATH instructor. We are also in need of someone to volunteer their time and expertise in updating our webpage which is currently "under construction". two hours or duration of lessons. Be able to work outdoors and with the special needs community.